As I started to lay out the blueprint for my own life and declare what I wanted to become, who I aspire to be and all of the big and small things I wanted to achieve I had an epiphany of why I hadn't laid out the foundation yet. During my quiet hours and moments of reflection, I looked at how I was loving myself and treating myself through money habits and began practising affirmations, money and abundance, it was like a light went on, mostly unconsciously, until the day came when I consciously realized: I deserve better. My reality had become a clear reflection of what I thought I deserved subconsciously. It was all so vivid as to inner and emotional issues I had with money. After reading articles upon articles and looking over my behaviors, I realized I was suffering from money avoidance disorder, feelings of scarcity and lack. The moment I made that connection, I released my fear of not having enough, living below my means because I didn't deserve more, small paychecks, or not charging enough for my creativity and thoughts. I SAID NO to the woman in the mirror and took action to improve my reality. I knew I had to take the first step and then the universe would follow and take care of me. Awareness is the first step in releasing the old habitual patterns of lack so that you can start living and breathing the feelings of a full life. This doesn’t mean overconsuming material things since we know "things" don't make us happy. It’s also having proper living conditions that feel safe and peaceful, having healthy food to eat, and the ability to enjoy some of life’s pleasures. So I began to work on my perception of myself, I realized I had to find all of the value and worth in myself as to why I should be more than convicted that I deserve to live an abundant life. 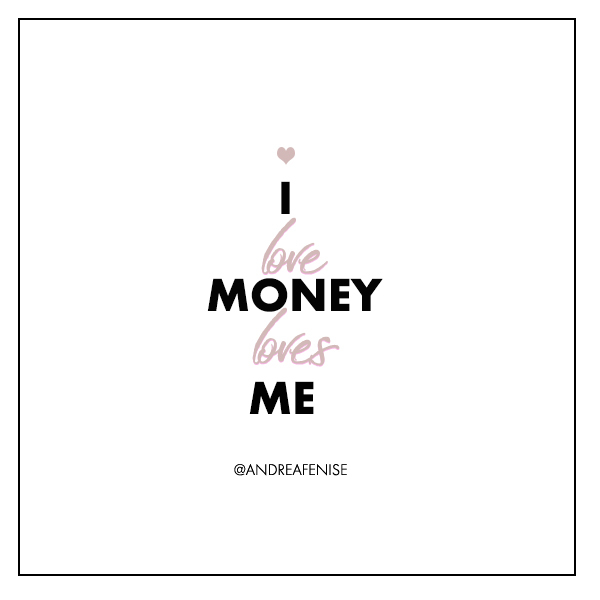 Inspiring affirmations began coming to me verbally and they whispered sweet messages to say to myself daily that would motivate me to raise my money self-esteem. I opened my heart to the universe to receive all of the abundant blessings it had waiting for me to receive, only if I was willing. I unclenched my tight fists that normally held on to every dime in fear that I would not get it back. I slowly opened my hands and lifted them up as wide as I could to the universe asking to supply me with endless streams of steady income. That belief and faith helped me look for better opportunities, which I finally believed I deserved, and put myself out there to pursue them. I discovered that I had to do my part, and then I had to surrender and trust that whatever was in the highest good would manifest. 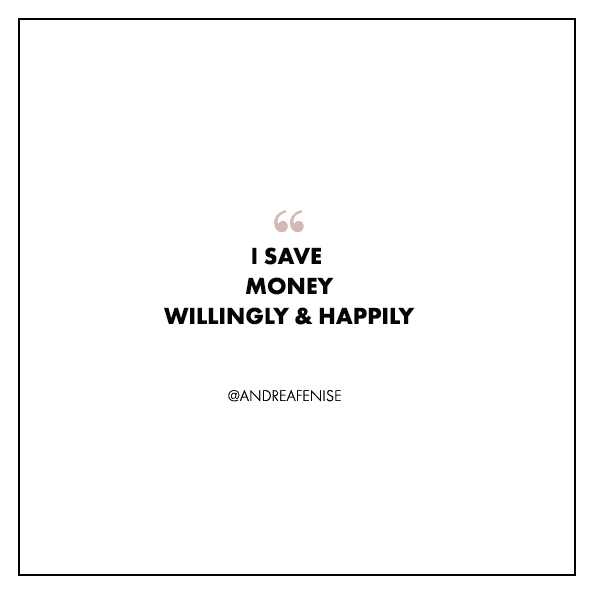 As creatives, many of us struggle with charging our full worth and that what we offer to others is not worth paying money for if they aren't willing to spend it. I had a big problem with that especially when others didn't see the monetary value of something I created with my thoughts and hands. I would lower my prices to compensate for their undervalue and then suffer the consequences of overworking and being underpaid. The affirmation I wrote below and have as wallpaper on my phone keeps me focused on the blessings the universe has for me as a working creative. Saying these affirmations and many others will increase your faith and energy, which will lead to increased positive actions to enhance your life. Start being kinder in how you talk to yourself, how much time you give yourself, and how often you treat yourself to something lovely. Buy that warm caramel macchiato and brownie while working towards saving for your dream home or vacation. Show yourself love and affection and I promise it will show you love and affection back. "I AM WORTHY OF RECEIVING MORE WEALTH." "I AM A LUCKY, HAPPY, HEALTHY AND WEALTHY PERSON"
"I SEE ABUNDANCE EVERYWHERE. " DO YOU HAVE ANY SIMILAR ISSUES? WHAT DO YOU DO TO HELP MOTIVATE YOURSELF?